Where I Got It: I own the paperback! While flying an Allied fighter plane from Paris to England, American ATA pilot and amateur poet, Rose Justice, is captured by the Nazis and sent to Ravensbruck, the notorious women’s concentration camp. Trapped in horrific circumstances, Rose finds hope in the impossible through the loyalty, bravery and friendship of her fellow prisoners. But will that be enough to endure the fate that’s in store for her? I liked Rose Under Fire so much better than Code Name Verity…which will come up a lot in this review. It’s as much a review of Rose Under Fire as it is an updated review of Code Name Verity (you can find my original review of Code Name Verity here). I wasn’t sure if I’d like Rose Under Fire, because while I liked Code Name Verity (well, I liked it the first time around, but after a second reading, I didn’t really like it), I think I was expecting something more like Code Name Verity. Rose Under Fire, to me, is told in a more traditional way than Code Name Verity. It’s much more straight-forward, and it was really emotional for me. There were a couple of times where I had to put Rose Under Fire down because I needed a minute to breathe. There are things that happen that got me so emotional- much more than Code Name Verity- and there were so many times when I was reading this book that I wished I felt the same way about Code Name Verity. I did go back and re-read Code Name Verity because I felt like I needed a refresher. The nice thing about Rose Under Fire is that you don’t need to read Code Name Verity first, but in a lot of ways, I’m glad I read Code Name Verity first. When I was re-reading Code Name Verity, I found that the story made a lot more sense the 2nd time around. Knowing what happened made the story make more sense, especially with how Verity is structured. Having re-read it while reading Rose Under Fire…certain characters made more sense. I did notice that this read that I really had force myself to keep going- I had a much harder time caring about what happened to Maddie or Julie, and it felt more technical this time than it did when I first read it. I understand why Verity did what she did, but it also made it harder to connect with what happened. Their friendship felt fake to me, especially in comparison to the friendships that Rose makes. In a lot of ways, I’m glad I read Verity first, because I’m pretty sure I would have hated it had I read it after Rose. I really do think Rose is the better of the two books. It was hard to read, because you see what it was like in a concentration camp for political prisoners. It very much focuses on Rose and the women she interacted with and became friends with, and while you don’t see the other people who were at Ravensbruck, you still get a glimpse of how horrible it was. Rose changes so much by the end of the book, and I wish we got to see her life a little bit more after getting out of Ravensbruck. But at the same time, I thought we got enough of what happened to see what her life was life after and how hard it was for her to adjust to everything. For so much of Rose Under Fire, I forgot that I was reading historical fiction, because it really felt like I was reading a memoir. Especially when Rose is actually in Ravensbruck, and what happened after. And that brings me to the author’s note at the end of the book. I loved that Wein had so many resources at the end of the book, much more than she included at the end of Verity. It’s so detailed, which is awesome, because- in my experience- you’re usually lucky if you get an author’s note in YA historical fiction. 4 stars. I didn’t love it, but it’s such an important story, and I liked it much more than Code Name Verity. 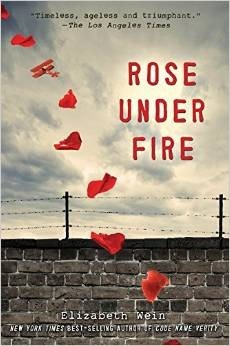 Your review makes me want to read Rose Under Fire more than Code Name. I read enough plot-heavy thrillers for now. I want characters and an emotional punch. A plot is always fun, but I find that a lot of thrillers just give you puzzles to solve, instead of an actual thrilling emotional experience. Rose Under Fire is definitely emotional, but totally worth it. I hope you like it!